The House of Jones: My Baby Is Growing Up! Well, as of today, Rebekah has not had her paci for SIX days! And I must say, the break up was very peaceful and easy. She misses her faithful friend, but is excited about the fact that she is just too big to have a paci anymore!! January: We moved Rebekah out of her crib and into a toddler bed. February: Our house was for sale, lots of cleaning and keeping it presentable for showing. March: Moved into and apartment. Rachel and Rebekah are now sharing a room. April: Completely potty trained Rebekah. May-July: Still in apartment and rooming with Rachel. I didn't want to deal with the trauma and keep everyone else awake. August: Moved into new house. Now Rebekah is in her own room and in a new, big bed. September: Rebekah started a new school. October-December: Crazy busy time with the holidays and just never got around to doing it. So, in January, we started talking to her about giving up the paci. She was dead set AGAINST it. We talked about taking all her current paci's to the store and letting her "pay" for a new toy with her paci's. Her response, "I have enough toys. I don't need anymore!" We talked about giving her paci's to another baby. Her response, "Baby's mommies get them paci's!" We talked about making a Paci Chart and getting stickers for sleeping without her pack. Her response, "I not want a chart. I don't like stickers." One thing that always came up whenever we talked about it. She didn't want to give up her paci because she was afraid. To quote her, "I need my paci. I don't want bugs to get in my mouth!" Not sure where this came from, but I guess if you sleep without a paci, then all the bugs get in your mouth! 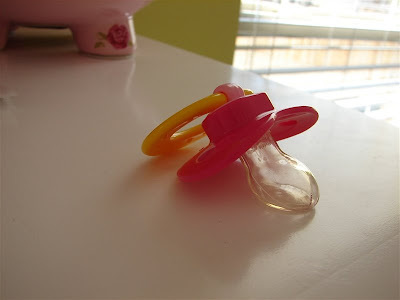 After all of this discussing, I finally told her, "Rebekah, one day you're going to be too big for your paci. And when you are too big, your paci will break!" I said this because in the back of my mind, I was thinking I could sneak in one day and cut a small hole in the bottom of the paci. Rebekah: This paci has a hole in it! Mommy: Really? Is it broken? Mommy: Well, you know what that means! You are too big for your paci! I am soooo happy for you, my big BIG girl!! Rebekah (pointing to the other paci in her room): That one has a hole too. That one is broken too. Mommy: You are so big. You don't need these anymore! Rebekah (handing me her paci): I don't want my paci's anymore. So, that was the end of their almost four year relationship. We put both paci's in the trashcan. No tears were shed....well, maybe one or two from Mommy when she saw her little baby grow up right before her eyes!! And she has slept good for both naptime and bedtime ever since!! Jennifer, thanks for sharing your story- i loved it- Silas had a paci til he was 3- my mother in law was keeping him 2 days a week for a few hours when i worked part time and she was helpful in breaking him- she made him put it under his pillow when he woke up and leave it in his bed- when he would go in and get it- she would say- are you ready to go night night- he would say nope- and shove it back under his pillow-so he got to where he only just slept with it- finally james got tired of him being 3 with a paci and he took them away cold turkey- i was weak and kept wanting to cave if he was sick or got hurt or something but james was firm and silas really did fine with it- better than me! ethan never wanted a paci- he had a blankie- it was a silkie and it was white- he called it his milk blanket (b/c it was white like milk) it is so tattered and loved- he was very attatched to it- well last moth we went to walmart and i was getting him out of the car and i said leave your blanket in the car so we don't loose it- he refused to put it down so we took it in and sure enough somehow he ddropped it and it is lost- i have checked the lost and found so many times they are sick of me- i keep praying it will trun up b/c i wanted to keep it with his baby things b/c it washis favorite- but so far no luck- it seems impossible now that it would turn up- but i have seen God do the impossible before! congratulations on the new milestone in your lives.